The seven chakras are doorways, or centers of vitality in your body which affect your spiritual, physical and psychological fitness. Hailing from Sanskrit, that phrase actually means ‘wheel’ and is conceived as a vortex of life providing stamina, based along the starting point of the vertebrae to your extreme top of the head as pictured in the body chakra chart presented below. The art of chakra healing has been used for centuries to balance important energy centers in our body called chakras. There are many tools that we can use, such as stones or meditation during chakra balancing. As a result of practicing the balancing tecniques you will have a physically healthier body and a calm mind. The first part of the exercise will focus on discovering the 7 chakras withing your energy body. You have to get a feeling of them and their position. So, first you will need tovisualize and identify each and every of the seven energy centers. Start with the root chakra and work your way to the top. As you feel them, it sometimes helps to imagine sparkling and shining balls of energy for each and every of the 7 energy vortexes. The initial step is to reach a meditative state, by sitting in a comfy position and getting rid of interruptions. Begin at the Root chakra and imagine a hot red energy field. This chakra is accountable for all material manifestation and also your relationship with the world around you. As you feel the root chakra, imagine your physical body and the energy vortexes glowing in your mind. The second energy vortex is a bright orange sphere located in your pelvic region. This energy center is the centre of sexuality, creativity, instinct and self image. This center is known as sacral chakra. The next of the 7 chakras is the Manipura. This is the center for the ego . Visualize it as a gorgeous yellow sphere of energy located two inches below your sternum. Anahata is the next of the seven chakras. It is responsible for for feelings, love and compassion. This is a soft green orb in your chest. The throat chakra is a blue sphere located at your throat. It is called VIshuddha. This is the center for communication and creative expression and it determines how you realte to other people. The next is the Ajna, it is located at your forehead and is of indigo color. This is the center for psychic growth and clairvoyance. This chakra is also known as the third eye. 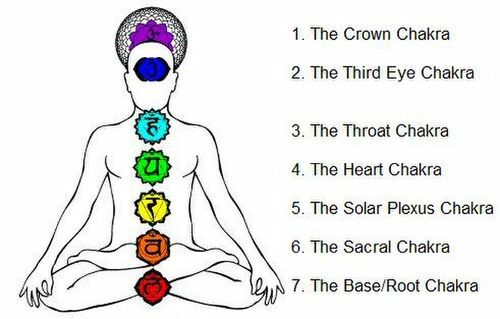 The crown chakra is found on top of your head and is of purple color. This is the chakra of the greater self, spirituality and knowledge. Each of these energy centers is absolutely important. When you get familiar with them and learn to feel their energies, imagine their energy rising and connecting and melding throughout your physical body. If you have a specific discomfort, locate the closest chakra and focus the mental image at the painful area on your body. When you get a feeling for all the seven chakras, imagine a pure golden ray coming from the top of your head and running to the first energy vortex. Visualize a silver beam of energy flowing in the opposite direction. Envision the two beams looping, encircling the body and connecting each of the 7 chakras to each other. When the loops connect, envision both energy circles joining and manifesting an infinite symbol surrounding the physical body. This visualization technique will help the chakras to synchronize and your physical body to harmonize itself so you will be able to reach your full energy potential.